Blogging: Speakers’ Corner of the Internet | O'Really? There is a famous place in London town, inside Hyde Park, known as Speakers’ Corner. It is a space where free speech and self-expression prevail. At Speakers’ Corner, anyone can say anything they like about anything they want to anyone who cares to listen. 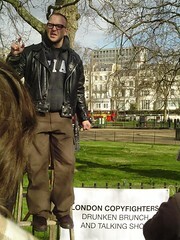 There are some obvious parallels between blogging and Speakers’ Corner as well as one rather striking difference. If you’ve ever been there, you’ll know Speakers’ Corner is full of circus acts. A quick wander around and you are almost guaranteed to encounter: conspiracy theorists, anarchists, bible salesmen, drunks, religious fundamentalists, pimps, tramps, radicals, punks, politicians, self-promoting exhibitionists, drug addicts, prophets and philosophers. Curiously you don’t often see professional scientists there. Some speakers will talk sense, others will talk nonsense. Either way, a stroll around Speakers’ Corner never fails to entertain, Sunday morning is usually best. Your personal beliefs will probably be challenged and you will almost certainly find someone to strongly dis/agree with. The digital equivalent of Speakers’ Corner is the blogosphere, the bloggers’ corner of the Internet. 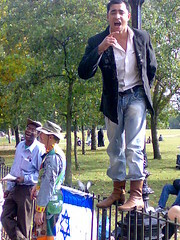 At Speakers’ Corner you need is something to stand on, a soapbox or stepladder, anything will do. Speakers also need time, an opinion and plenty of air in their lungs. This is “free” speech in two ways. Firstly, it doesn’t cost anything, so you don’t need money or powerful friends to be a speaker. Secondly, speakers are free to discuss anything they want. The same is true of blogging, all you need is some kind of blogging software and off you go. The hecklers will post their comments if they choose. At Speakers’ Corner anyone is free to shout. Speakers, like bloggers, have to entertain, and shout loud, to build an audience and get their voice heard, whichever corner they find themselves in. No sh*t Sherlock! Speakers’ Corner is not about technology, and neither is blogging. The digital technology that makes blogging possible (news feeds, software, servers etc) is no more interesting than their analogue counterparts: soapboxes and stepladders. Yes, digital soapbox technology is cheap and readily available but to my mind, blogging is not about technology. Well, duh! As well as all these similarities, there is one striking difference between Speakers’ Corner and the Blogosphere. When you have had enough of the speakers ranting and raving, you can walk away, returning to the relative peace of Hyde Park. However, on the Internet, bloggers are everywhere not just in the corner of the Internet park. This is partly due to the fact that there are lots more of them, more than 70 million bloggers on the internet by some counts. Consequently, the collective noise bloggers make can be deafening, but it is the unmistakable sound of free speech all over the Internet. Since this is my last post for 2007, happy holidays to all readers at nodalpoint. If you’ve read any of my posts here thanks for reading, you’ve been a wonderful audience and thanks again Greg for running the nodalpoint server. While I’m packing up my digital soapbox for the year, may I wish your speech in 2008, wether digital or verbal, to be of the free variety wherever possible. And, if you’ve ever seen a professional scientist talk at Speakers’ Corner, I’d love to hear about it. [Speakers’ Corner Pictures above by Jim Callender and Cory Doctorow, part of the excellent pictures of Speakrs’ Cornr on Flickr].